Bring a calming presence to your office with this desk sculpture that forms natural landscapes with sand. 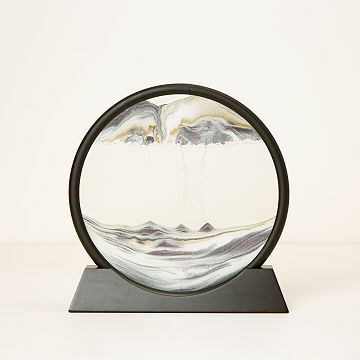 Place this magical beauty on a bookshelf, desk, mantel, or coffee table, rotate the glass ring, and watch as delicate drifts of light, dark, and glittery golden sand shift into deserts, mountains, clouds, rain, oceans, and smoke, all ebbing and flowing into one another. Handmade in Austria. "It's so easy to get lost in the ever-changing artistic formations of the Deep Sea Sand Art." "This is the coolest most mesmerizing desktop gift ever." Want to make a statement? See our Oversized Octagonal Sand Art here and our Oversized Shifting Sand Art here! Long fascinated by science, the cosmos, and the stars, "Sandman" Klaus Bosch creates interactive pictures based on the beauty that can be found in the natural entropy of substances like sand. A talented craftsman, his designs celebrate the idea of being part of the bigger picture of the universe. Do not use in direct sunlight. Turn the picture at least once every month. Click here to learn about the Science of Sand Art. This is Not Your Everyday Gift! My brother in law uses the art piece at night to help him relax for sleep. He said it's mesmerizing, watching the sand build new scenes. He and my sister love this new ritual. Purchased as a gift. Not as attractive as pictured. Glass not crystal clear, a bit hazy. Sand colors less vibrant. My girlfriend mentioned she used to love to play with Magic Eye as a child, so I found her this and she loves it! Great for displays, and it is ever changing. Very lovely. Nice gift idea as opposed to a consumable. Ever-changing, beautiful artwork in my home for me to enjoy each day. Also very calming to watch as it magically creates a new sandscape. Each new creation is beautiful, elegant, calming, and graceful. Whoever created this is genius! The mix of different-colored components makes each new sandscape a masterpiece! I look forward to giving this phenomenal and unusual item to my closest friends. The perfect gift for our Legacy donors! We will be ordering more and giving them to our Legacy Donors. In the meantime we keep stealing it from the Executive Director's office to place in our own until he discovers it missing. It's so peaceful and beautiful! My whole family is mesmerized by this awesome gift.